Proposition 37 was defeated in California in 2013. This means no state will require GMO foods to be labeled. "As goes California, so goes the nation." You cannot avoid GMO foods. They are already ubiquitous (everywhere) in our food supply. You are already eating them everyday. They will NOT go away. Monsanto, and the other food giants, have made sure of that, as they now run the FDA. They are too profitable to give up. There are currently over 170 million acres just in the U.S. devoted to these toxic crops. Monsanto owns many seed patents on these science fiction monstrosities. Genetically modified foods grow faster, grow larger, and are supposedly more resistant to insects and disease. They make farmers more money. It's all about the money. The FDA said there was "no difference between these and regular crops." That is their official statement. You are already eating GMO foods every day. The main culprits are corn, soy, and canola. You should not be using canola oil anyway. Buy only organic soymilk and soy foods. Be careful about any corn products. Shopping at the health food store won't help. You can't possibly even think of growing every single food you eat. They should be banned entirely, but labeling has a better chance of being passed. Sure, it would be ideal to ban them completely. Isn't going to happen. If we could just get labeling laws passed, we can avoid all GMO foods. Almost no one would buy them, and they would disappear. This will not happen in America though. Fifty countries already use GMO labels, including all of Europe. In these countries there simply are no GMO foods, because people don't want them and refuse to buy them. The U.S. government actually had to subsidize this garbage with your tax money to pawn them off on the unsuspecting. Labeling is not going to happen however. Bill HR4432 will see to that. The food giants like Dean, Kellogg's, General Mills, Pepsico, and all the rest, have made sure they do not have to label GMO foods. The same is true of the countless fast food outlets. They don't want to label their foods either. They have all paid off everyone in Congress to insure that. If these poisons are labeled, no one in their right mind will buy them. The failure of the California referendum proved people just don't care how much GMO food they eat. Incomprehensible! The American masses are just too stupid to care. India has simply banned all GMO foods. Period. That is what every country should do. Just ban them. Banning is not going to happen in America, however. If simple, honest labeling was required, almost no one would buy them. Think it is going to help to buy "healthy brand names"? Think again. Kashi is owned by Kellogg, and is full of GMO foods. They deny it, because they are worthless liars. Silk Soy Milk is owned by dairy giant Dean Foods. It is full of GMO soybeans. Larabars are made by General Mills, and are full of GMO grains. Such famous brands as R.W. Knudsen and Cascadian Farms are full of GMO foods. 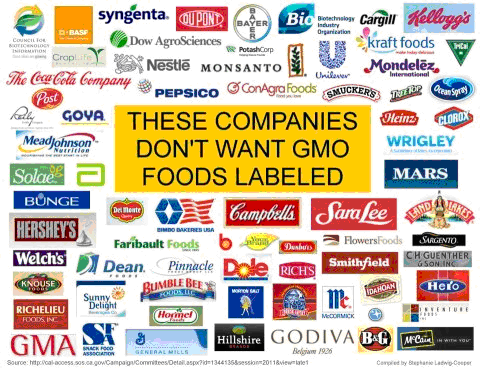 All of these companies are paying off Congress to not label GMO foods. That's right, the "healthy brand" companies are our enemy. Profit is their bottom line. It will cost them to source non-GMO foods. They don't want you to know the truth. Major chains like Whole Foods are hiding the fact they are selling GMO foods. One quarter of what they sell contains GMOs. They have been doing this for over a decade now. They do everything possible to keep you from knowing their stores are full of them. They actually instruct their employees to lie to you and say, "Whole Foods sells no GMO foods at all." Is all they have to do is tell every supplier to accurately label their foods. That's all. Just label them as to whether they have GMO foods or not. They won't do it though. Get used to eating GMO foods, because you'll be eating them the rest of your life. We do need more animal and human studies to see the specific long term effects, but these take time. No person or animal should be eating these FrankenFoods. These are Frankenstein science fiction genetically reprogrammed foods for profit. In 2015 Monsanto has almost perfected GMO wheat. This was very difficult, but soon it will be on the market. The stupid farmers will prefer it to real wheat, just like they prefer the other GMO crops. Google the GMO Ticking Time Bomb, a 15 minute youtube movie by Gary Null. Spend just 15 minutes learning the truth If you Google "dangers of GMO foods" you'll get about one million websites, with endless scare stories that will make you afraid to ever eat again. We do not understand genetic engineering at all. Genetic engineering of our plant and animal food supply can only end in disaster with FrankenFoods. These are not going away. The only answer in America is labeling, and that's not going to happen. An out-right ban would be the ideal of course. This is said reluctantly folks...but live with it. You have no choice. You cannot stop this, as the mega-corporations have bigger wallets than us. Thank the people behind the One World Order who did this. In 2014 the Republicans submitted bill HR4432 which would prevent all states from passing GMO labeling laws! Ironically enough it is called the Safe and Accurate Food Labeling Act. Is that too much for words? Monsanto Corporation obviously controls the U.S. government. We should not just label them, but ban them outright as other countries have done. It's not going to happen here.